Corel Ventura 10 is a powerful, feature-rich publishing application that combines virtually all the capabilities that professional publishers demand. With exceptional versatility, Corel Ventura lets you integrate information from virtually all media sources - including text, graphics, charts, tables, spreadsheets, and databases. You can create text directly in the application's all-purpose editor or you can take full advantage of the industry's most extensive set of import filters to incorporate data from almost any format into your publications. 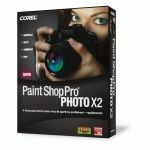 The ability to import XML documents makes Corel Ventura the ideal publishing companion to Corel XMetaL. To give you precise control over the formatting of imported XML documents, Corel Ventura uses the new XML Mapping Editor to create mapping files. This functionality, combined with the application's extensive import filters, allows you to gain maximum reuse from all forms of content. 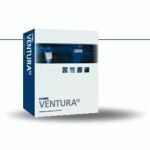 Corel Ventura 10 is the ideal application for combining and transforming your organization's information and data into highly manageable, structured documents. In addition, Corel Ventura boasts comprehensive character, frame, page, paragraph, rule, and table tagging that can save considerable time. 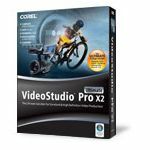 To further increase your ability to manage and maintain your publishing projects, Corel Ventura includes the dockable Tag window and navigator tools. You can also use programming languages, such as C++ or Microsoft Visual Basic, to automate any command used during publication production. You can also fully customize the application's user interface to reflect your workflow. The ability to generate endnotes and footnotes, headers and footers, cross-references, forms, indexes, markers, tables, and tables of contents makes Corel Ventura a compelling choice for any page layout and design project. From small booklets to long, structured, text- and graphic-intensive publications, the boundless capabilities of Corel Ventura exceed those of other publishing applications. 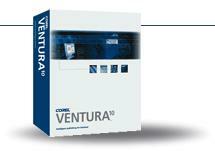 The output capabilities of Corel Ventura enable seamless output to many industry standard devices and formats. Featuring a powerful print engine that produces high-quality PostScript output, Corel Ventura offers brand-new Publish to PDF functionality, and prepress options that include separations, imposition, and layout enhancements. As professional publishers know, accurate, reliable color management is essential to achieving high-quality color output. To facilitate this, Corel Ventura features enhanced color management that includes support for the International Color Consortium (ICC) and the industry-leading ColorSync technology. In addition, first-rate page layout and typesetting tools allow you to easily manipulate words and pictures in structured publications. In the complex world of business publishing, highly structured documents are common, which makes software stability essential. 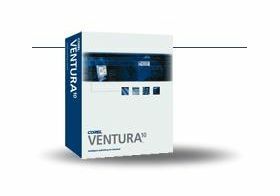 Corel Ventura is a complete solution for any publishing professional, offering the stability, tools, and features needed to output professional results in print or electronic format. Combining the latest technology to create a more stable application environment, Corel Ventura can help you reduce production time and cost for all your publishing projects.